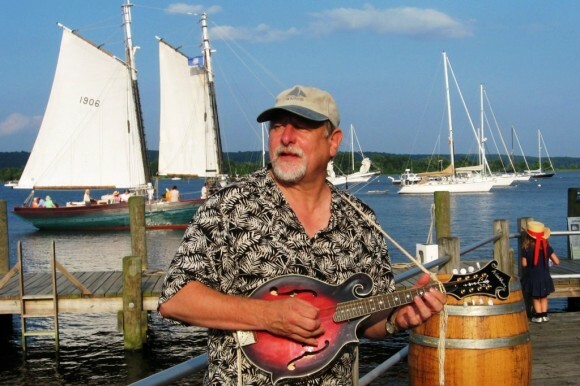 Top chantey singers Rick Spencer (above), Geoff Kaufman, Dan Quinn and Joseph Morneault will perform at Chantey Blast to benefit the Connecticut River Museum on January 15. 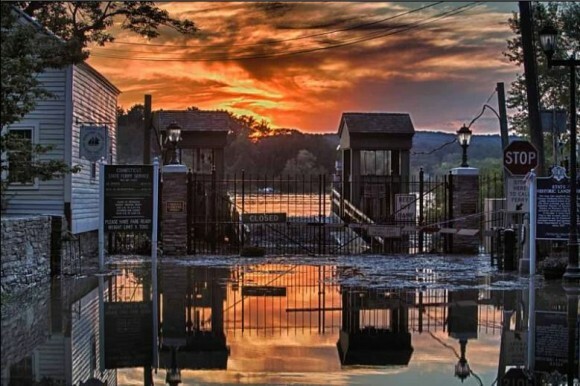 Essex, CT – When word got out that the Connecticut River Museum had sustained severe flood damage from Hurricane Sandy, area maritime musicians decided to rally for the cause and put on a benefit concert to raise funds to help offset the $70,000 of repair expense. Chantey Blast, scheduled for Tuesday, January 15 at the Centerbrook Meeting House, will feature some of New England’s top sea chantey singers in a rollicking celebration of the Connecticut River. The concert will showcase the many talents of musicians Rick Spencer, Dan Quinn, Geoff Kaufman and Joseph Morneault and others in both solo performances and group arrangements. The event kicks off at 6:00 pm with a chantey man “meet and greet” and a bit of libation followed by the show from 7:00 pm to 9:00 pm. The Centerbrook Meeting House is located at 51 Main Street in the Centerbrook section of Essex . Parking and seating is limited so come early. The suggested donation is $20 but all are welcome. The Connecticut River Museum is a private, non-profit organization dedicated to the preservation and celebration of the cultural and natural heritage of the Connecticut River and its valley. For more information, go to www.ctrivermuseum.org or call 860.767.8269. 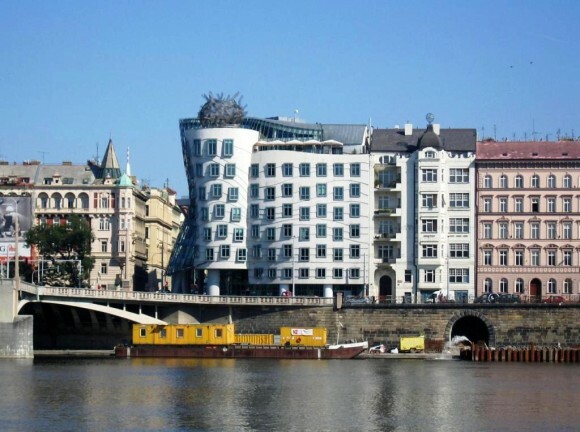 The Nationale-Nederlanden building by Frank Gehry, built in Prague, Czech Republic, known as “Fred and Ginger” for its resemblance to a dancing couple, is one of the designs featured in “The Building Next Door” with John Dixon, FAIA, on January 11th at 7 PM at Essex Town Hall, part of Essex Library’s Centerbrook Architects Lecture Series. The Essex Library presents “The Building Next Door: How Architecture Relates To Its Context”, a talk by John Morris Dixon, FAIA, part of the continuing Centerbrook Architects Lecture Series, Friday January 11th at 7 PM at Essex Town Hall. An MIT graduate, John Morris Dixon began his career as an architectural journalist in 1960. He served as chief editor of Progressive Architecture 1972-96, helping achieve the magazine’s worldwide influence. The breadth of his knowledge and insight has made John Dixon a much-valued observer on numerous design juries and selection panels. In recent years, he has written for such publications as Architectural Record, Architectural Research Quarterly, Architecture, Competitions, Domus, Harvard Design Magazine, House & Garden, Office insight, and Places. This talk is free and open to the public; Essex Town Hall is located at 29 West Avenue.please call the Essex Library at 860-767-1560 for more information or to register for this program. As we mentioned in Part 1 of our review of Chester restaurants, it is truly a wonder that such a little town has so many fine restaurants. Part 1 profiled four of them, the Villager, Simons Marketplace, River Tavern and Pattaconk 1850. Here in Part 2 are four more Chester restaurants. Karen Williams, the Manager of Cabo Tequila Grill, is virtually a one woman show. For instance, she personally squeezes one lime at a time to concoct, perhaps one should say to mastermind, the ten different kinds of margaritas that are offered at the Cabo Tequila Grill. Williams says that the “Traditional” margarita is still the favorite at her Water Street restaurant. At Cabo its ingredients are: Milagro Silver Tequila, Agavero Orange Liquor and fresh limes (hand squeezed by the manager). The runner up in popularity is the “Pomegranate” margarita, made from Don Julio Anejo Tequila, Stirrings Pomegranate Liquor and, again, fresh hand-squeezed lime juice. There are regular weekday specials at Cabo Taquila Grill. They include: Margarita Monday,” when traditional margaritas are reduced to $6 each. In the same vein on Tequila Taco Tuesday, the special is three Street Tacos and a shot of Don Jula Silver for $7. Then, there’s Wine Wednesday, where you get a bottle of wine at half price, when purchased with an entrée, and finally on Thirsty Thursday, the price for top-ranked Sauze Hornitos Margaritas are $6, which is $2.50 off the regular price. On Friday, Saturday and Sunday the prices are as stated on the menu, but none of them would break the bank. For example, the Appetizer, Cabos Nachos, which is made from refried beans, and no less than eight other ingredients, costs but $11.95. As for Entrees the long list of selections includes, Chicken Enchiladas for $15.95; as well as a Pulled Pork Taco, accompanied by corn tortillas with queso fresco, pico de gallo, sour cream and sofrito rice and refried greens, also for $15.95. For dessert Cabo Tequila Grill serves homemade flan and a chocolate Mexican cake from a “secret recipe,” among other the desert items. Williams is assisted by her daughter, Morgan, who her mother says, “is a cook herself.” Right now “mother” Williams says that she is working as much as seven days a week. Also, she has managed Cabo since it opened in Chester four years ago. 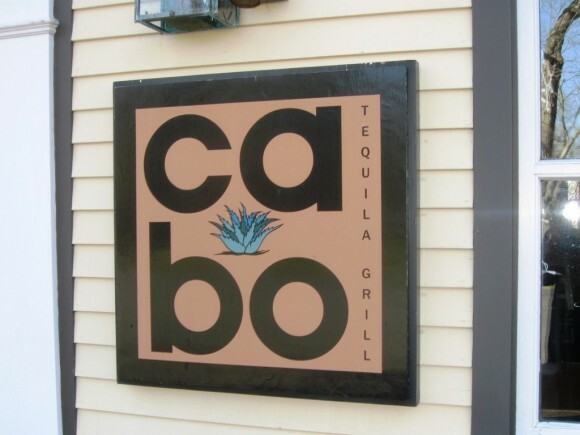 Cabo is open seven days a week. Hours are: Monday through Thursday from 5 pm to 9 pm, and Friday, Saturday and Sunday from 5 pm to 10 pm. The restaurant is at 4 Water Street in Chester, and the telephone number is 860-526-8277. 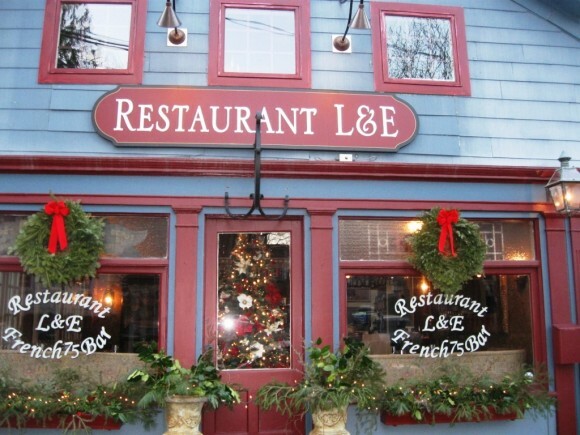 “We serve quality food in a comfortable and inviting atmosphere,” is how L & E co-owner Linda Reid describes the dining experience at her L & E Restaurant in downtown Chester. The “L” in the restaurant’s name, incidentally, stands for “Linda,” and the “E” is for Everett, the first names of the two, married owners of the restaurant. The Reid’s opened their L & E restaurant close to four years ago, taking up the space that was previously Restaurant Du Village. The Reid’s have continued the French theme of their predecessor with a “French 75 Bar” on the first floor, and with many French styled selections on the menu. Also, a number of the staff, who once worked for Du Village, now work at L & E.
The “French 75 Bar” at L & E must takes its name, perhaps, from the French 75 field gun of World War 1. Also, in 1915 Harry’s bar in Paris created a “French 75” drink made from gin, champagne, lemon juice and sugar. There is also a strong French emphasis in the food that they serve at L & E. For example, Starters include a Salad of Duck Confit, an item which consists of Celery Root Puree, Gingered Figs and Red Wine Syrup. A highlight on the Soup and Salad section on themenu is s French Onion Soup with Cherry Vinegar, Three Cheeses and Braised Oxtails, and one of the salads is Pan Fried Chicken Livers with Smoked Bacon Lardons, Frisee and Poached Egg. Entrées include Venison “Osso Bucco” with Sweet Potato Sardalize Gratin and a Salad of Pears and Dried Black Cherries. Another entre is Pan Seared Atlantic Skate Wings with Brown Butter with Pancetta and Leek Confit with a salad of Arugula and Cranberry Beans. In additional to the downstairs that L & E took over from Du Village, the Reid’s have created an Upstairs L & E out of what was once an apartment on the floor above the restaurant. Prior to moving to Chester, Linda and Everett Reid for several decades owned the American Seasons Restaurant on Nantucket Island, and, subsequently, a bistro, also on Nantucket. The Chef’s wife and partner, Linda Reid, has developed a passion and deep knowledge of American wines, and she has been recognized in the Wine Spectator magazine. On Tuesdays L & E offers “Burger Nights,” which feature for $14 a “sumptuous” burger with fries and a glass of house wine or a beer. On Wednesdays and Thursdays, there is also a $25 Prix Fixe dinner. The prices on the main menu range from $12 to $21 for Starters; $12 to $14 for Soups and Salads, and $26 to $32 for Entrees. Prices are similar at the Upstairs L & E. The restaurant is closed Monday and is open Tuesdays thru Sundays from 5:00 to 9:00. The Upstairs L & E is open Fridays and Saturdays from 5:30 to 9:00. L & E is located at 59 Mains Street, and the telephone number is 860-526-5301. The Wheatmarket at lunch time offers the following made-to-order sandwiches: (1) a chicken and grape salad sandwich, (2) a store roasted, top round of beef sandwich with horse radish and cheddar cheese, (3) a tuna works sandwich with sprouts, carrots, dill and Havarti cheese, (4) an old-fashioned bacon, lettuce and bacon sandwich, as well as other sandwich selections. 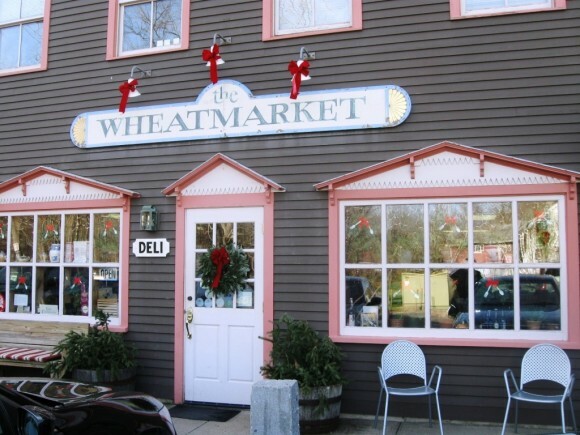 Also at lunch time The Wheatmarket features “made from scratch” soups, including a homemade baked potato soup; chicken rice and a chicken noodle soups; house made chili; and cream soups of asparagus, tomato or potato. Deserts feature slices of Deep Dish Apple pie and a selection of saucer-sized cookies, including a ginger cookie, which is close to habit forming. As for beverages there is “Honest Tea,” which is low in sugar, plus an array of soft drinks, including root beer, birch beer and Sarsaparilla tea. All of these items can be eaten at one of the tables at The Wheatmarket, or they can be taken out. Although The Wheatmarket opens at nine in the morning, it does not offer much of a breakfast. You can get a muffin and coffee to tide you over, but that is about it. She means that children that once came in with their parents are now parents themselves. As for the adults back then, well let’s just say they are now a bit older. 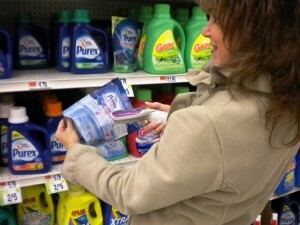 Over the years Joan Welch has listened to a number of life’s travails from her customers. “Sometimes I feel like a bartender,” she says of her role as a sympathetic ear. Friends are friends after all, and Joan Welch has many friends among her customers. Another indication of the passage of time at the market is that one of the former young dishwashers is now a medical doctor. Also the Welch’s two boys are now grown men. In fact, the younger son, Mark, is the Manager of the Colonial Supermarket in Essex. Serving soup and sandwiches is all that many people know about The Wheatmarket. But it is only half the story. 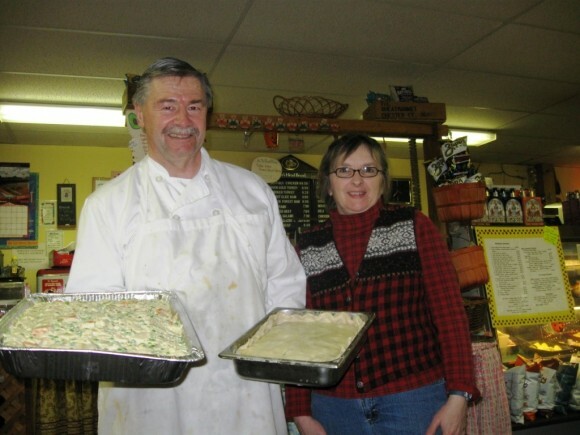 In the large kitchen in the backroom of the market, Chef-Owner Dennis L. Welch conducts a full blown catering business, and don’t think that this is a small operation. Just before Christmas The Wheatmarket catered complete meals for a group 600 people. This order entailed making some 600 pounds of Lasagna, and 300 pounds of Sausage and Pepperoni, according to Chef Welch. Chef Welsh, who is deeply involved in his catering business, also tells the story that once he was hired by a very successful business person to cater a dinner for literally hundreds of the host’s friends and clients. Then, shortly before the big event, the Chef received a call that the host had died. This meant the cancellation of the big dinner. However, Welch says that he did cater the funeral of the departed host. In fact, these days Welch says catering funerals, “last suppers” you might call them, has become an important part of his business. About the only event that could threaten the present success of The Wheatmarket could be major flooding of the Pattaconk River. The river is just across the parking lot from the market. But now is not the time to think about such things as floods. The Wheatmarket is decked out for the season, and Joan Welch has put together a couple of monster gift baskets, which a customer can take home for $60. Also, one suspects that even in this happy season, she is prepared to offer a listening ear to a customer who wants to talk to her about private things. 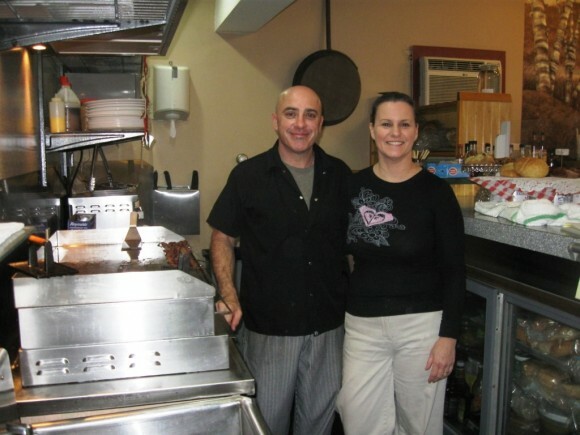 On November 29, ValleyNewsNow.com published a review of the Six Main Restaurant in Chester, entitled, “New Chester Vegan Restaurant Receives Top Rating from the New York Times.” The headline of the Times’ article was, “Artistry at Work,” and the Timesgushed at the skills of the Six Main Restaurant’s Chef, Rachel Carr. The ValleyNewsNow.com article about Six Main Restaurant, and the Times enthusiastic endorsement, can be easily found by scrolling down to Recent Articles by Jerome Wilson on the ValleyNewsNow.com. The New York Times review referred to in the article was published on November 16. One new development at the Six Main Restaurant is that it has recently put in place new soundproofing on the interior ceiling of the restaurant. After all, the restaurant space was previously used by a bank, which clearly did have the sound levels of a busy restaurant. ESSEX— Voters at a town meeting Wednesday approved a new property tax deferral ordinance for elderly and disabled homeowners while also extending the town’s existing elderly tax relief ordinance through November 2018. Only a handful of residents turned out for the town meeting, with the ordinance approved on a nearly unanimous voice vote. One resident, Wally Schieferdecker, voted no, contending the ordinance was not clear on what would happen to outstanding taxes if it is not renewed in 2018. The plan first proposed last summer by First Selectman Norman Needleman expands on an existing elderly and disabled property tax relief ordinance approved by voters in 2004. The ordinance, which currently assists 57 elderly and disabled property owners, allows the town to match any tax relief provided under the state’s Circuit Breaker Program for property owners who meet income guidelines. The existing ordinance, along with the new option, requires that property owners meet the “rule of 85,” being at least age 65 and a resident of Essex for at least as many years needed to add up to 85. Disabled property owners must meet Social Security Administration requirements for total disability. The new option approved Wednesday allows eligible property owners to apply for a deferral that would freeze their tax bill, with the higher tax amount for future years becoming due within 90 days after the death of the taxpayer or the sale of the property. The new option would supplement, not replace, any tax abatements provided under the existing ordinance. The revised ordinance allows the town to place a lien on the property for the deferred tax total. Needleman said he would have preferred to offer an expanded tax abatement for eligible homeowners, but analysis determined that an expanded abatement would have been too costly over the long term. Needleman said the deferrals and tax liens would continue after 2018, but acknowledged the ordinance may need revision in future years. Selectman Joel Marzi said the deferral option was “a solution worth trying,” as a way to offer some additional assistance to long-time residents who are having difficulty paying a rising property tax bill. The revised ordinance will become effective next month, allowing interested property owners to apply for the benefit between February and mid-May for deferrals in the tax year that begins in July 2013. Property owners must be fully paid up on all real estate and motor vehicle taxes due by May 15 to apply for the deferral option. The Essex Elementary School Foundation, a not-for-profit, volunteer organization that provides independent financial resources for worthy enrichment projects and programs at Essex Elementary School, had granted $23,480 to fund various programs during the 2011-2012 academic year. Some of the specific programs receiving grant money that year included an iPad Lab enrichment program with $13,000 given for the purchase of 19 iPads, 19 smart covers, 19 Apple care protection plans and iPad Applications in the math and science areas for all grade levels. This academic year, The Foundation is looking to grant many of the programs that have successfully been put in place such as; the Justus W. Paul World Cultures Program with $5,000 granted for the development of a new Haitian culture program and for the implementation of previously developed programs on China and India; Grade Level Grants of $1000 per grade awarded to three grades each year on a three year rotating schedule; and the Historian-in-Residence Program. This year they are looking to give additional funds to the school as the needs arise. 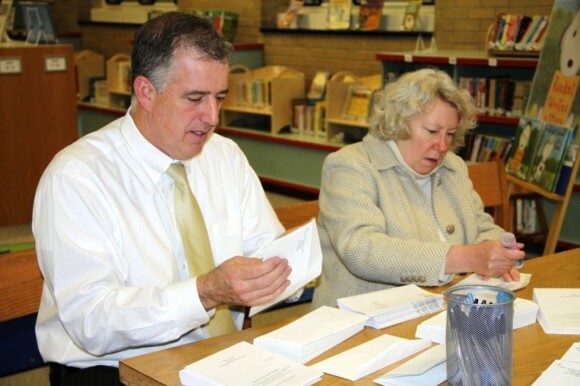 On Tuesday, November 27, EESF board members met at the school’s media center to launch the Foundation’s annual direct mail campaign to Essex area residents and businesses. Continued growth in financial support will allow the Foundation to expand the enrichment programs and projects now underwritten by the organization. In October, the Foundation announced grant awards totaling approximately $23,000 for the development and implementation of several programs during the 2012-2013 school year. been to create a significant endowment that can support the school’s strategic vision to be a world-class educational institution. Each year, 5% of the EESF endowment is allocated for programs and projects proposed by Essex Elementary School administration and staff. Past grants have also funded a Scientist-in-Residence program, literacy support materials, equipment for musical and physical education, playground improvements, logical thinking games, and audio/visual equipment. For more information about the Essex Elementary School Foundation or to make a tax-deductible donation visit www.essexelementaryschoolfoundation.org or make checks payable to “Essex Elementary School Foundation” and mail to Essex Elementary School Foundation, PO Box 882, Essex, CT 06426. Ramblin’ Dan Stevens will be performing in the SPECIAL CONCERT IN THE GALLERY at the Leif Nilsson Spring Street Studio and Gallery, 1 Spring Street, Chester on January 6, 2013 from 4 p.m. to 6 p.m.
Dan performs an eclectic mix of traditional fingerstyle blues and originals and has entertained audiences throughout the US, Germany, UK, Canada and Virgin Islands. Of special interest is his unique style of “bottleneck” slide playing popularized by early Mississippi delta bluesmen including his use of a homemade, three stringed “Cigar Box Guitar” and one stringed “Diddly Bow”, both primitive blues instruments. 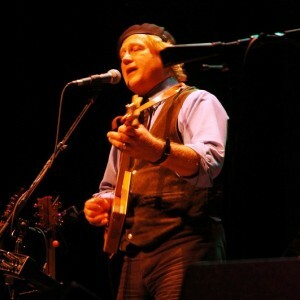 Dan has been lauded for the authenticity of his approach gained by many years on the road as a traveling blues musician. Dan has appeared with such artists as Arlo Guthire, Richie Havens, Charlie Daniels, James Cotton, Gatemouth Brown and many others. For more info on Dan Stevens, please visit www.danstevens.net. The Pattaconk 1850 Bar and Grille is offering 1/2 off an appetizer and $3.50 for a glass of wine or a beer, before or after the concerts. $10 donation suggested for admission – BYOB – Bistro Style Seating. Call (860) 526-2077 – nilssonstudio.com for more information. REGION 4— The Chester Board of Education Tuesday approved the new three-year contract for Region 4 teachers, setting up a required 20-day on-file period before the agreement becomes effective. The board approved the contract, which will provide about 220 teachers serving Chester, Deep River, and Essex with a total 9.5 percent salary increase over three years, on a 7-1 vote, with member Ashley Marsh opposed. The Chester board, which governs the operations of the Chester Elementary School, lacked a quorum when the district’s three other school boards, the Region 4 Board of Education and the local school boards for Deep River and Essex, approved the agreement at a Dec. 6 meeting. The approvals were unanimous for the two local boards, but the vote for the Region 4 board that governs the two secondary schools was three members supporting the agreement, two opposed, and one abstaining. Two members, including board Chairwoman Linda Hall, were absent. Members Laurie Tomlinson of Deep River and Mario Gioco of Chester voted against the contract, with member Ann Monaghan of Chester abstaining. Each had questioned the impact of the total salary settlement on future budgets and tax rates for their towns. Board members that had participated in the negotiations that led to the agreement, including current Supervision District Chairwoman Wendy King of Chester, maintained the salary package was in line with other nearby school districts, and that rejecting the contract would lead to last and best offer binding arbitration with the cost of the process to be paid by the school district. The contract provides teachers with an average 3.9 percent salary increase in 2013-2014, a 1.7 percent pay increase in 2014-2015, and a 3.9 percent increase on 2015-2016. The totals include step increases on the 12-step teacher salary schedule in 2013-2014 and 2015-2016, but not in 2014-2015. The anticipated total cost increase of the package would vary among the four boards, ranging from 9.12 percent over three years for Region 4, to a total 11.3 percent hike in salary expenses for Deep River Elementary School. Under state las the contract is now filed with town clerks for the three towns for 20 days, a period where the board of selectmen for any town could request a town meeting vote on the agreement. Rejection of the contract by voters in any of the three district towns would block approval and send the contract negotiations to binding arbitration. While selectmen in the three towns are expressing varying degrees of concern about the budget and tax rate impact of the contract, a move to force a town meeting vote on the agreement is considered unlikely with the tight 20-day on-file period that falls over the Christmas and New Years holidays. Such a challenge has never occurred in previous Region 4 contract negotiations. Deep River selectmen discussed the contract at a Dec. 11 meeting, with all three selectmen, First Selectman Richard Smith and selectmen Angus Mcdonald Jr. and David Oliveria, expressing concern about the cost of the three-year package. Smith said he objected to providing a 3.9 percent pay hike in the first year, with two additional increases building on that. Mcdonald predicted “a sticky spring” for education budgets that could lead to teacher job cuts to limit the budget and tax rate impact. But Deep River selectmen did not move to challenge the contract, and are not scheduled to hold another meeting until Jan. 8, at the end of the 20-day file period. Essex First Selectman Norman Needleman said the contract “is not the way I would have negotiated it,” but added that board negotiators “did the best they could,” given that pay raises for district teachers have been lower over the past five years. Needleman said it would be “counter-productive” to challenge the agreement and send the negotiations to binding arbitration. 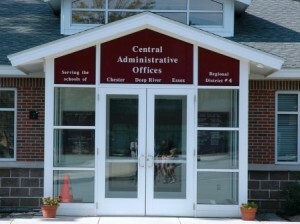 The Chester Board of Selectmen were scheduled to discuss the Region 4 teacher contract at a meeting Wednesday evening. According to several of its employees, Walmart stopped selling guns at its store in Old Saybrook five years ago. 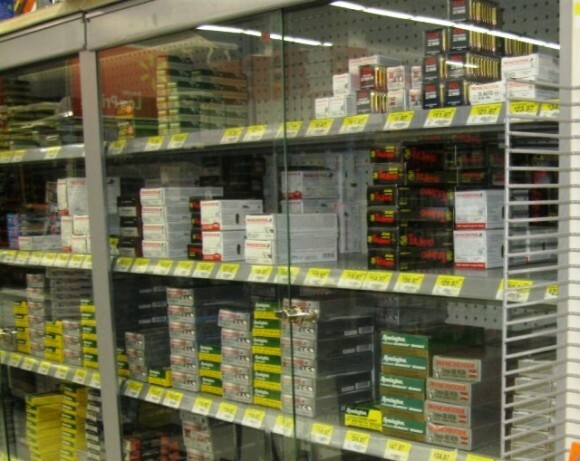 However, the store still has plenty of gun ammunition for sale, although it is kept under lock and key. 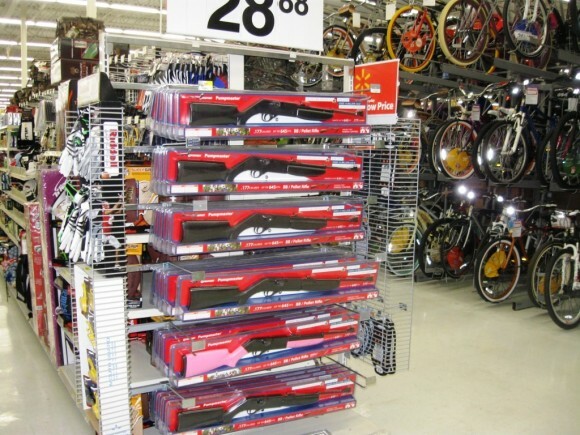 A potential buyer has to ask a Walmart employee to unlock the cases to purchase the bullets for the various makes of guns. 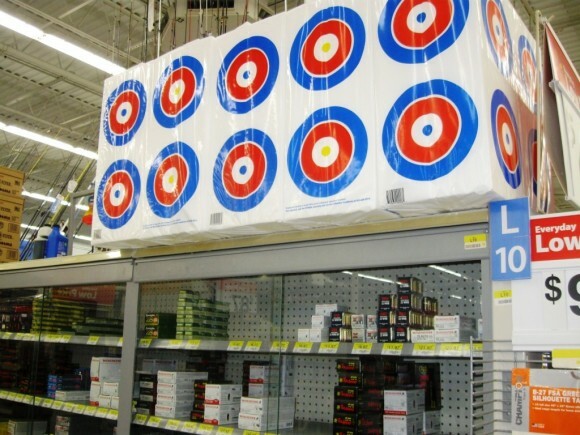 Also, above the locked ammunition show cases are packages of gun targets. In addition, in an exhibit near the entrance of the store, there is a large display of BB guns and their ammunition for sale. BB guns are on sale for less than $30. An informal survey among employees of stores in the shopping plaza confirmed that there was no store in the Old Saybrook shopping plaza that has guns for sale. There was, however, speculation that guns might be purchased in Groton, and certainly in other parts of the state. After the terrible shooting tragedy in Newtown, Connecticut, on December 14, many shoreline residents who shop in Old Saybrook are concerned about the sale of guns in the state. DEEP RIVER– Police in Pickens County, South Carolina have arrested three suspects in the home invasion murder of 23-year-old Steven Grich, a former Deep River resident who graduated from Valley Regional High School and was attending Clemson University at the time of the crime. Grich was shot to death Saturday night at his residence in Central, S. C. after four men entered the dwelling through an open back door. 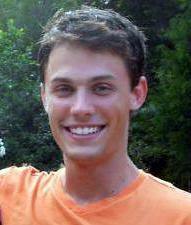 Grich, a junior engineering major at nearby Clemson University, shared the residence with 29-year old Robert McKinley. Police investigating the crime later charged Mckinley with possession of marijuana. Police believe the suspects may have thought the two men had a larger quantity of marijuana at their residence, though only a small amount was seized by police. By Monday, police had arrested three men, ranging in age from 19 to 24, on charges of murder, armed robbery, burglary, and weapons possession. A fourth suspect, age 18, is still being sought by police. Grich was raised in Virginia, but lived in Deep River during his high school years, graduating with the Valley Regional High School Class of 2007. He attended New England Technical College in Rhode Island for two years, but moved to South Carolina and entered Clemson University after his family moved to the state about three years ago. Friends and former classmates of Grich are planning a vigil in his honor Friday evening at the skateboard area at Plattwood Park. How did it happen that the little town of Chester has one, first class restaurant after another? But who cares how it happened, just that it did. Let’s begin with The Villager at 13 Main Street, which opens its doors at 5:30 a.m. every morning on weekdays, and an hour later on weekends. It closes at 2:00 p.m. 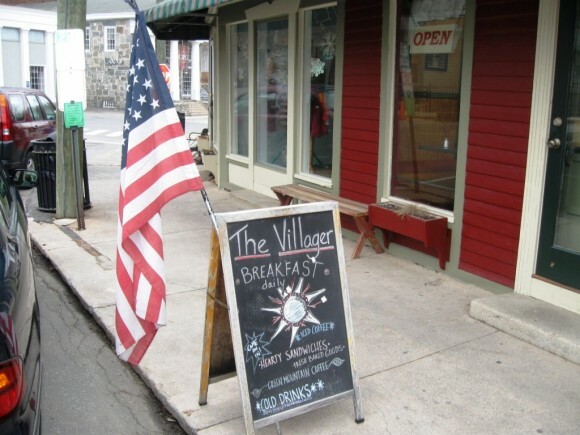 The Villager starts its breakfast at 5:30 a.m.
Diane and Frank Voccia, who took over the Villager a year ago this coming January, serve what you would expect at these early morning hours. Basically, its breakfast, breakfast, and breakfast, with everything freshly made. Diane takes the orders, and Frank does the cooking, and unlike many other cooks he can actually make a soft, scrambled egg. Also served are pancakes, meats, fries and delicious toast. The bread for the toast comes from Fabled Food Bakery in Deep River, which only sells wholesale. The clientele at The Villager is what you would expect among early risers, utility company workers all suited up for a second cup of coffee before they head off to clear brush and climb up telephone poles. Also, along one whole side of the restaurant there sit the newspaper readers. They sit there for the better part of an hour, because there is a lot to read in a daily paper, especially when you are nursing a second cup of coffee. 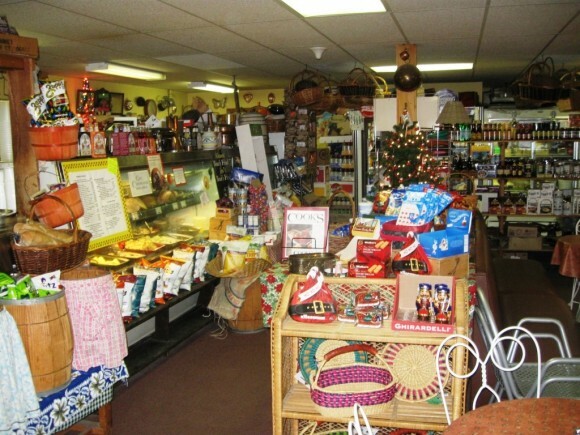 Next down the road at 17 Main Street is Simon’s Marketplace. The Marketplace opens at eight in the morning, and closes at six o’clock in the evening. Also, there is breakfast from 8:00 until 11:30 am. 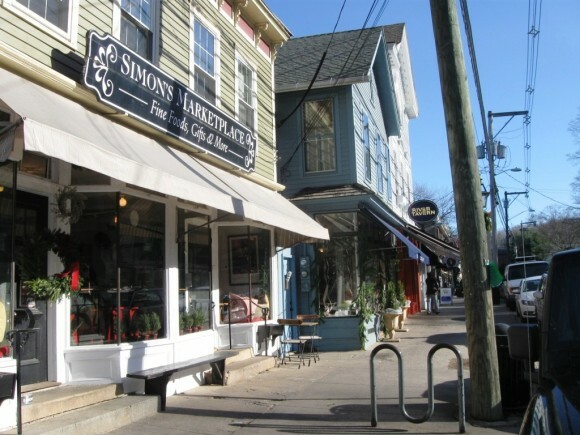 Simon’s owner, Jim Reilly, when asked what is special about his popular place says, “Everything is fresh, everyday.” Specialties include “great salads” with ingredients such as fresh fennel, corn beef, walnuts, chicken, goat cheese, pasta and arugula in many different combinations. Reilly says, “Everyday, we do five new salads.” Also, portions at Simon’s are very, very large. In fact, it is not unusual to see diners splitting a single sandwich for two. The house also makes a variety of soups, a popular item. Menu favorites also include: meatloaf, roasted salmon, and the “very popular” pulled pork. Also, Simon’s can cater to both vegetarian and non-vegetarian customers. Not content with running just one restaurant. Reilly for the past 17 years has also run the Blue Oar, an open air restaurant in Haddam along the Connecticut River. 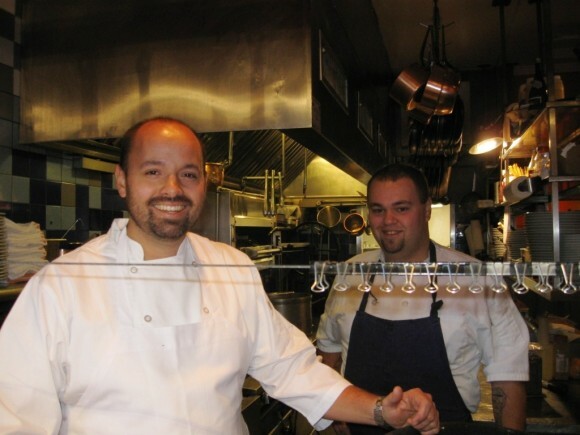 Without question River Tavern is the “Big Kahuna” among Chester restaurants. Located at 23 Main Street, it has set a high bar that other Chester restaurants can only attain to. 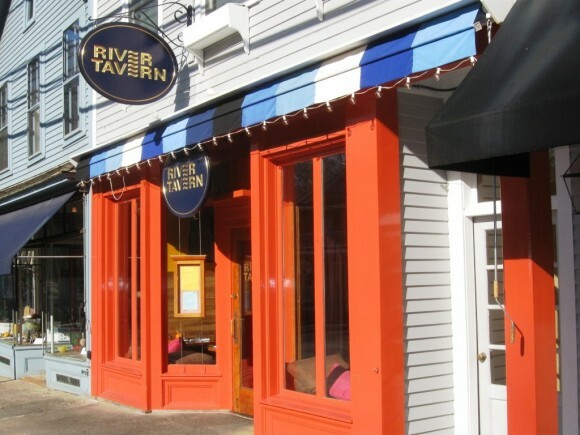 Although, essentially, a high quality dinner restaurant, River Tavern also serves weekday and Sunday lunches as well. Lunch hours are: 11:30 am to 2:30 pm, Monday thru Saturday. Sunday lunch is from 11:00 am to 2:30 pm. Dinner hours are 5:00 pm to 9:30 pm, Monday thru Friday, with slight variations on Saturday and Sunday. As for the food Executive Chef Chris Flahaven says, “We do everything to order, and we only serve local produce.” “We support our local farms,” he also points out. As for style the offerings at River Tavern can be very original and even complicated. They are also with very few exceptions simply delicious. Here are some samples dishes from the River Tavern web site. Dessert: chocolate-whipped ricotta with toasted pistachios, crushed amaretti cookies & grapefruit zest. Prices for the above are 12, 28 and 12 dollars, respectively. Dessert: ginger-plumb crème brulee. These items are priced at 13, 28 and 6 dollars. In addition to this dazzling display of culinary creativity, River Tavern has a number of price gimmicks to get you in the door. They include ½ price wine on Monday and Tuesday evenings; ½ price cocktails on Wednesday and Thursday, and a $10 children’s menu on Sundays. Wine prices at River Tavern range from $350 for a bottle of Champaign Moet & Chardon Perpignan Brut 2002, to $14 for a bottle of Pinot noir rose on a half price wine night. Still there is some truth that Pattaconk 1850 is something of a bar; at least when compared to its down the street competitors, River Tavern and 6 Main Restaurant. 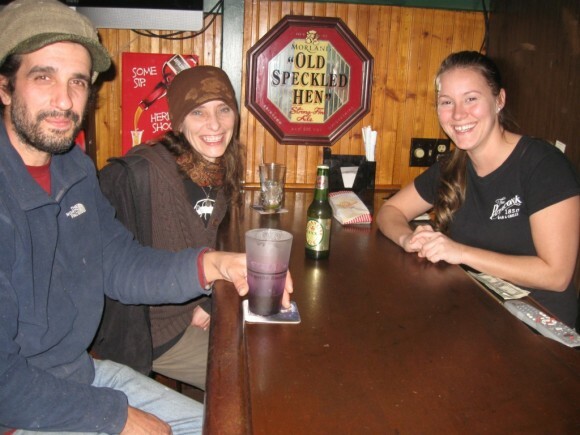 In fact, on a busy weekend evening Pattaconk 1850 can have as many as three deep at the bar at its 33 Main Street location. 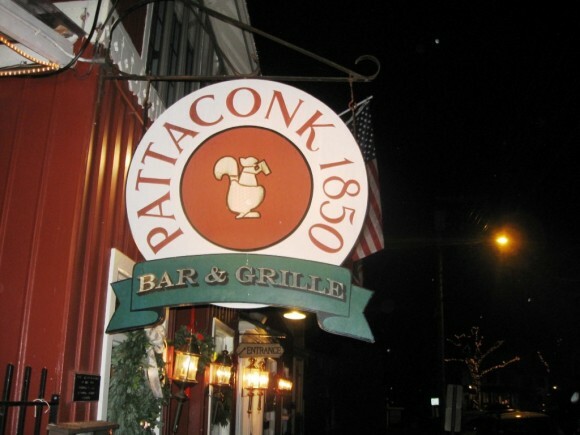 As for the “1850” in the title of the restaurant, Manager Gallbraith says that the Pattaconk 1850 restaurant was founded sometime in the mid-nineteenth century, but no one really knows when. So they just picked up the “1850” the middle of the century. The Estuary Council of Seniors, Inc. Partners with Reynolds Subaru of Lyme, CT to “Share the Love” this Holiday Season. Subaru’s “Share the Love” event helps deliver nutritious meals and compassion to Old Saybrook, Westbrook, Old Lyme, Lyme, Killingworth, Madison, Essex, Deep River, Clinton and Chester’s seniors. 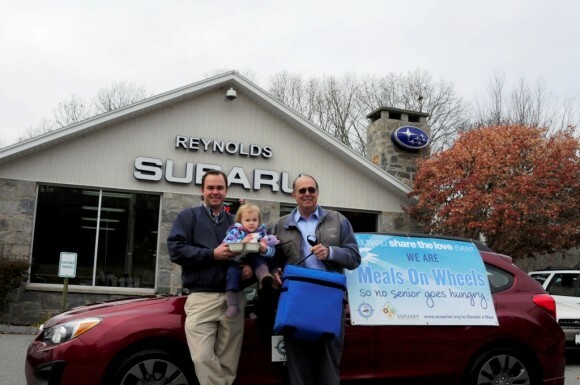 The Estuary Council of Seniors, Inc. is proud to announce it has partnered with Reynolds Subaru of Lyme this holiday season to deliver meals to seniors in all ten towns and to provide awareness of the funding needs for senior nutrition. Since June 2010, The Estuary’s senior nutrition budget has been cut $102,000. Last year the Estuary provided 60,000 meals to seniors in the ten town area. The “Share the Love” campaign kicked off on November 21st with the three generations of the Reynolds family participating. Hayden Reynolds, his daughter, Lilly and his father, Gary; three generations of the Reynolds family, personally delivered meals in Lyme. Reynolds Subaru has loaned The Estuary a Subaru car for daily meal delivery throughout the six-week campaign. The Reynolds family has been serving the shoreline for over 150 years, they started back in 1859 with horse drawn carriages, today the 6th generation of the Reynolds provides his community with Subaru’s for a safe and reliable all wheel drive vehicle. Each week thereafter through the holidays Reynolds Sales, Parts and Service staff as well as local Rotary Clubs and the First Selectmen of our ten towns will also visit seniors delivering meals. Local Girl Scout and Boy Scout Troops from the shoreline towns are making holiday cards which they will deliver to each senior along with their meal and a Christmas plant the week before Christmas. Christmas plants are being donated by Clinton Nurseries and Grove Gardens of Clinton, Riggio’s of Essex, VanWilgens of North Branford and the Old Saybrook Walmart store. This local effort is part of the Meals on Wheels Association of America’s (MOWAA) participation in the national Subaru of America, Inc. “Share the Love” Event. As one of the five Subaru “Share the Love” event charitable partners, the Meals on Wheels Association of America (MOWAA) is awarding $200,000 in “Share the Love” grants to local Meals on Wheels programs that partner with Subaru dealerships in the fight to end senior hunger. The Estuary Council of Seniors, Inc. is eligible to win a MOWAA-Subaru “Share the Love” grant of up to $35,000 to help provide hot, nutritious meals to homebound seniors in all ten towns it serves. Hayden Reynolds is spearheading a “matching funds competition” and hopes that many other local businesses will join him. If you are interested in providing a tax deductible financial match or a partial match to the grant they hope will be awarded to The Estuary Council of Seniors please contact Sandy at 860 388-1611. 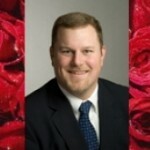 “We are honored to be part of ‘Share the Love’ for a fifth straight year,” said MOWAA Interim CEO, Larry J. Tomayko. “Subaru recognizes the importance of giving back to the communities it serves. Working together, MOWAA and Subaru are helping to provide more than just a meal; we’re bringing warmth and compassion to so many hungry and homebound seniors who would otherwise go without.” The Subaru “Share the Love” Event runs from November 21, 2012 to January 2, 2013. Subaru is donating $250 for every new Subaru vehicle sold or leased during “Share the Love” to the customer’s choice of one of five charities, including MOWAA’s Meals on Wheels. Over the past four years, proceeds from the Subaru “Share the Love” Event have provided funds to MOWAA to support its vision to end senior hunger by 2020. Joan Wallace, a resident of Centerbrook, will be displaying representational paintings in oil at the Essex Library during the month of December. She is a member of the Lyme, Clinton, and Madison Art Associations, and has studied under distinguished painters including Hollis Dunlap, Diane Aeschliman, Jack Broderick and Jack Montmeat. All works are available for purchase. For more information contact the artist at 860-767-0477 or jmwall888@yahoo.com. REGION 4-— A new three-year contract for teachers provides a total salary increase of 9.5 percent over three years, including 3.9 percent for 2013-2014, 1.7 percent for 2014-2015, and 3.9 percent in 2015-2016. The contract for about 220 teachers in the Chester-Deep River-Essex school district has been approved by the union. The agreement was approved at a Dec. 6 meeting by three of the district’s four school boards. The Chester Board of Education, which governs the operation of Chester Elementary School, lacked a required quorum at the Dec. 6 meeting, with a Dec. 18 special meeting called to vote on the agreement which must be approved in separate votes by each of the four boards. The votes at Thursday’s meeting were not unanimous, with some board members expressing concern about the total cost of the salary package after details of the agreement were presented by labor lawyer Kevin Roy with the Hartford firm of Shipman & Goodman. The agreement had been concluded in early October with assistance from a state mediator. While the local school boards for Deep River and Essex were unanimous in approving the contract, three members of the Region 4 Board of Education dissented after first asking for more time to consider the agreement. Board member Ann Monaghan, a Chester Democrat, questioned whether the total salary package would “sit well”, with district taxpayers in the continuing economic slowdown. Wendy King, the chairwoman of the Chester Board of Education who is chairwoman of the combined Supervision District Board for 2012-2013, said “these numbers are the best numbers we could have obtained,” without entering last and best offer binding arbitration. King said the binding arbitration process would cost the district up to $100,000 with no guarantee of a lower salary package. Monaghan later abstained from voting on the agreement, with board members Mario Gioco of Chester and Laurie Tomlinson of Deep River, both Republicans, voting no. The salary increases will vary for each teacher, depending on what step the employee is on in the district’s salary schedule. About 25 percent of the district’s teachers are veteran educators at the top step of the salary schedule. The salary package includes step increases for 2013-2014 and 2015-2016, but no step increases in 2014-2015. The agreement also requires teachers to pay an increasing share of their health insurance costs. The employee share under the district’s preferred provider plan would increase from the current 18 percent to 18.5 percent in July, 19 percent in July 2014, and 20 percent in July 2015. Employee shares under the health savings account option would rise to 15.5 percent in 2015-2016. Teachers volunteering for extracurricular activities, such as coaches, advisors and tutors, would receive a one percent increase in their annual stipend in each of the three years. The overall cost of the salary package will vary for each school board depending on the number of teachers at the various steps on the salary schedule. For the Region 4 Board of Education, which governs the operation of Valley Regional High School and John Winthrop Middle School, the cost increase over three years would be 9.12 percent. The salary package would be most costly for the Deep River Board of Education, 11.3 percent over three years. The total increase would be 9.65 percent for the Essex Board of Education, 9.39 percent for the Chester Board of Education, and 9.34 percent for personnel providing shared services for the supervision district. The current contract which expires June 30 was part of a two-year wage/salary reopener that was provided under an agreement first negotiated in 2009. The salary reopener negotiated in the fall of 2010 with help from a state mediator provided a one-half percent general increase for 2011-2012, with a two percent increase for teachers at the top step. For the current year, there was a one-half percent increase for teachers at the top step, with basic step increases for all other teachers. If the agreement is approved by the Chester school board on Dec. 18, it must then be posted with the town clerks of each town for 20 days, a period during which the board of selectmen of each town could decide to challenge the agreement and send it to a town meeting vote. Such a challenge has never occurred in previous Region 4 contract negotiations. Negotiations would move to binding arbitration if the agreement is not approved by the four school boards. Deep River First Selectman Richard Smith said Friday he believes the raises provided under the contract are “pretty high,” and “front loaded” to have a major impact on the budgets and tax rates for 2013-2014. Smith said Deep River selectmen would discuss the contract at the board’s regular meeting Tuesday. Local conservation groups are inviting amateur photographers to focus on the celebrated and scenic countryside of Lyme, Old Lyme, Essex, Salem, and East Haddam and submit their photos to the Eighth Annual Amateur Photo Contest. This contest is being funded with the generous support of Lorensen Toyota, Oakley/Wing Group at Smith Barney, Evan Griswold at Coldwell Banker, Ballek Garden Center, Essex Savings Bank, Murtha Cullina LLP and ChelseaGroton Bank. In addition to the above noted prizes, a special $100 award will be given in memory of a former contest judge, John G. Mitchell, for the best photograph that promotes and supports our environment and biodiversity. “As a former editor at National Geographic, John dedicated his career to writing about the environment and conservation and so the award is for the best picture reflecting that subject” explained Tony Sullivan, the conservation trusts’ spokesperson. “We are delighted by the caliber of the judges we have been able to attract for this year’s contest,” said Sullivan. With a salmon hatchery program no longer clouding issues, the US Fish & Wildlife Service, National Marine Fisheries Service, and directors from CT, MA, VT and NH have a singular opportunity to redeem the Connecticut River restoration. They’re currently making choices for restoring migratory fish north to Bellows Falls, VT, begun under the 45 year-old New England Cooperative Fisheries Compact. The decisions stem from the 1965 Anadromous Fish Conservation Act. They’ll seal this ecosystem’s fate at four federally-licensed dams and the Northfield Mountain Pumped Storage Station until 2058. Sadly, in 1980 their predecessors abandoned two miles of the Connecticut to the power company operating at Turners Falls and Northfield Mountain. By allowing privatization of the river at mile 120, they killed chances of passage success for millions of American shad barred from spawning at Greenfield, Gill and Northfield, MA, right to the foot of Bellows Falls at Walpole, NH at mile 172. Unwittingly, they also continued the decimation of the ancient spawning grounds of the river’s last, 300, viable federally-endangered shortnose sturgeon. Half or more of those shad swam upstream; but foundered in the treacherous Turners Falls complex. At the dam, just as today, some depleted their energies by treading water for weeks—washed back and forth by a power company’s deluge-and-trickle releases, finding no elevator or upstream entrance. Many eventually turned back, only to be tempted by spill from their power canal. Fish unlucky enough to ascend the ladder there found a desperate compromise. Over 90% wouldn’t exit alive. Just as today, alien habitat and extreme turbulence overwhelmed them. Only 1-in-100 emerged upstream. For the rest, a turnaround spelled almost certain death in turbines. Others lingered for weeks in an alien canal environment, until they expired. Just as today. This year over 490,000 shad passed Holyoke. Half or more attempted to pass Turners Falls. Just 26,000, or 1-in-10, swam beyond the dam–a percentage consistently reached in the 1980s. This is described as “success” by US Geological Survey Conte Lab scientists, Dr. Alex Haro and Dr. Ted Castro-Santos, after fourteen seasons of canal study. In work garnering annual power company subsidies, they’ve attempted to model that canal is a viable migration path. Citizens upstream of the 1798 Turners Falls Dam need not accept the dead shad runs and severed ocean-ecosystem of the last 214 years at a dam operated to cull price-spikes from the electricity “spot market.” An 1872 US Supreme Court decision against owners of Holyoke Dam mandates passage of the public’s fish. Nor do citizens from Old Saybrook, CT to Bellows Falls have to accept endangered sturgeon, a lethal canal, and a dead river at mile 120. After 32 years of fatal attraction at Turners Falls, its time to stop steering fish into a canal death trap. Holyoke proves that’s possible. REGION 4— The school district has approved a 2013-2014 school calendar that cuts the February winter break while holding classes on Veterans Day and restoring the Columbus Day holiday. The calendar, along with some minor revisions to the calendar for this year, was approved Thursday by the Supervision District Committee. The committee unanimously approved a calendar option that was endorsed last week after lengthy discussion by a calendar subcommittee. The 2013-2014 calendar will continue to recognize the two autumn Jewish holy days, which was done for the first time this year, while making the second Monday in October Columbus Day holiday a day off for students but a professional development day for district staff. School was in session for Columbus Day this year. In 2013, school will be open for the first time on the second Monday in November Veterans Day holiday. In the biggest change, the 2013-2014 calendar will reduce the February winter vacation to just two days, Feb. 17, which is President’s Day in 2014, and Feb. 18. The reduced break will start early for students with a half-day professional development day on Friday, Feb. 14, 2014. The school year would end on June 11, 2014, depending on the number of days lost to weather events. The major point of discussion for the calendar committee last week was whether to hold a half-day session on Wednesday, Nov. 27, 2013, the day before Thanksgiving, and add one additional day to the February break, or whether to have the day before Thanksgiving off, as was done this year. The committee decided that with absences increasing on the day before Thanksgiving, students would gain receive more instructional time by having that day off and attending class on the Wednesday in the winter break. In a minor change to the current calendar, there will be a one-half-day session on Friday Jan. 18. This would open up one additional snow cancellation day in a year where a full week of school has already been lost to Storm Sandy. DEEP RIVER— After a six-month closing for construction, the Village Street bridge was reopened to traffic Thursday afternoon. The bridge over the Deep River, located on Village Street behind the Deep River Library, was closed for the reconstruction project at the end of May. First Selectman Richard Smith said Friday he is pleased with the bridge replacement that was done by Brunelli Construction of Southington. Engineering design work for the new bridge was done by Jacobson Associates of Chester. The price for the bridge construction was $1.11 million. The project was funded under the Local Bridge Program, with federal funds covering 80 percent of the total cost. The town was required to pay 20 percent of the project cost. 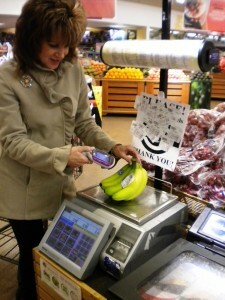 What is smarter than a smart phone, more enduring than a dozen cookies and classier than a Chanel handbag? The answer is — a gift membership in the Essex Library Association, the perfect holiday gift! Membership in your local library is a truly meaningful, lasting gift for family and friends. Long after the other holiday offerings are used and set aside, a library membership keeps on giving, because it keeps the library thriving. Membership matters because it provides funding to keep the library doors open, the children’s and adult programs lively and relevant, and the shelves stocked with the best new books, audio books and DVDs. Beyond that, a gift membership makes both the donor and recipient partners of Essex Library in promoting reading, lifelong learning, community spirit, and civic pride. What better gift could there be? Membership is available at levels from $35 to $1,000. And membership does have its perks! Each level of ELA membership comes with an attractive and functional ELA keepsake, including magnets, mugs, totes and boat bags, plus a special treat for children. The recipient of membership will remember your thoughtful gift and your support of the library for years to come. Your donation to the Library is also tax deductible. 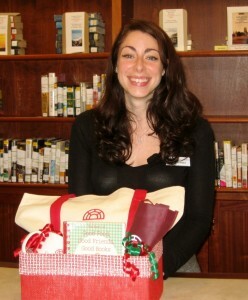 Drop by the Essex Library to see the pretty gift baskets, and finishing your holiday shopping in one stop. 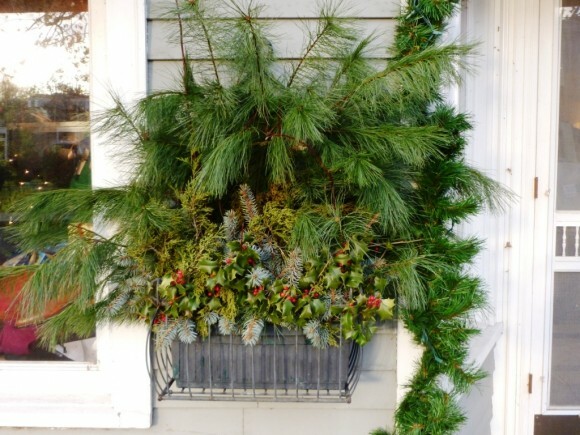 In the spirit of the holidays, the Essex Garden Club has once again decorated the merchant window boxes and doorways of Essex with a variety of evergreen cuttings provided by members and other generous donors from the community. A special attraction is The Silent Policeman, decorated by DeeDee Charnok and Gay Thorn. During the Club’s annual holiday festivities, Club members collected 276 lbs of food for the Shoreline Soup Kitchens and delivered it to the Westbrook Pantry. This amount of food is the equivalent of approximately 200 meals. Given that this donation exceeds last year’s by more than 4 times, a hearty thank you goes to Janice Atkeson and her volunteers for their efforts. The Essex Garden Club extends its best wishes to all the residents of Essex Centerbrook and Ivoryton for a healthy and happy holiday. CHESTER— An anticipated need for a larger room has led the planning and zoning commission to postpone a public hearing that had been set for Thursday on a proposed zoning regulations that would limit the keeping of some poultry on residential property. The public hearing on the regulation proposed by local residents John and Bonnie Bennet is now set for Thursday Jan. 10 at 7:30 p.m. in the all purpose room at Chester Elementary School. The public hearing was to be held at the Chester Meeting House on Liberty St. The proposed regulation is clearly generating opposition among many residents, with signs posted around town urging the commission to “keep Chester chicken friendly.” It was the anticipation of a large crowd that led to the rescheduling of the public hearing to a larger meeting room. Gregory R. Shook, President & CEO of Essex Savings Bank, is pleased to announce the addition of Lisa M. Berube as Assistant Vice President, Branch Manager of the Chester office located at 203 Middlesex Avenue, Chester. 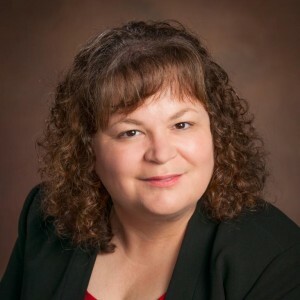 Lisa held numerous positions in banking since the 1990’s, and most recently served as Branch Manager at the Chester Branch of Bank of America. Prior to that, Lisa held various NASD licenses and served as an Investment Representative. Lisa attended Middlesex Community College and also the New England College of Finance. She is very active in the local community. She is a member of the Deep River & Chester Lions Club, she serves as treasurer for the Salvation Army Mid-Middlesex County Service Unit, she is a member of the Mount Saint John Gala Committee, and is a past member of the East Haddam Ray Board. Essex Savings Bank opened its sixth branch on December 3, 2012. The branch is located within the Chester Town Hall building. Lisa will be joined by the following staff members – Sarah May, Karyn Shultz, Isabel Roberge, and Jennifer Frohlich. Essex Savings Bank is a FDIC insured, state chartered, mutual savings bank established in 1851. The Bank serves the Lower Connecticut River Valley and shoreline with offices in Essex (2), Chester, Madison, Old Lyme and Old Saybrook. 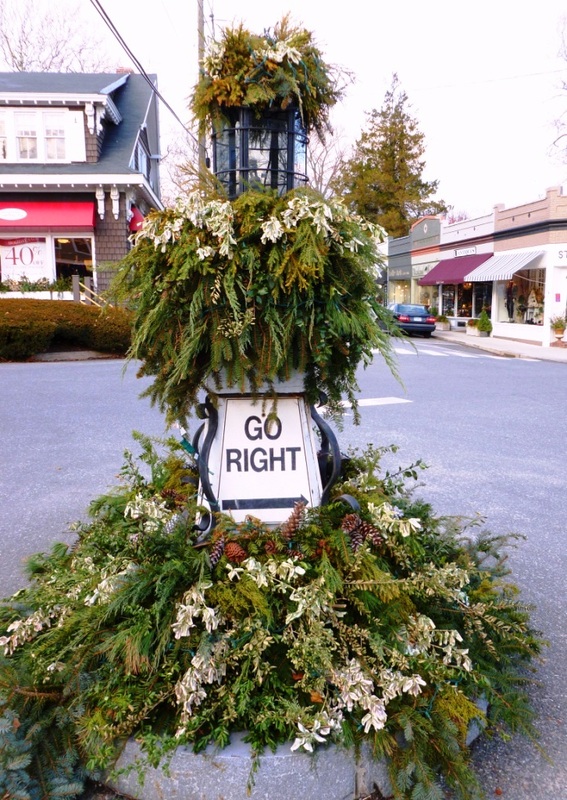 Deep River, CT – At 3 p.m. on Wednesday, December 12, Deep River Town Hall will host an event to decorate a floral portrait of tissue donor Robert Novak, Jr. On June 7, 2008, after winning a golf tournament with his father, 33-year-old Rob suffered an undetermined medical episode and died while driving home. Among those who benefited from his gifts of life were three infant boys. At the event, Rob’s family, including wife Sage and daughters Grace and Natalie, will put the finishing touches on his floragraph. Following this event, the portrait will travel to Pasadena and appear on the Donate Life Rose Parade Float titled “Journeys of the Heart” on January 1, 2013. Sage, Grace and Natalie will also be traveling to Pasadena for the Rose Parade and Donate Life Float official events. The floragraph, a portrait made entirely of organic floral materials, will be one of the floral portraits that will appear on the Donate Life float to honor the lives of organ and tissue donors and the decision they made to give the gift of life by donating their organs. The floragraph is sponsored by CryoLife. 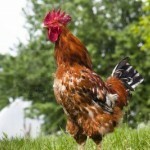 CHESTER— The planning and zoning commission will hold a public hearing Thursday on a petition from a local lawyer to change zoning rules on the keeping of chickens, specifically roosters and capons. The public hearing begins at 7:30 p.m. at the Chester Meeting house on Liberty Street. John and Bonnie Bennet, of 23 Story Hill Road, have petitioned for a change in the definitions section for poultry. John Bennet, who has an office in Essex, is the long-time town attorney for Chester and a frequent moderator at town meetings. Bonnie Bennet is a former Chester judge of probate. Trees in the Rigging event organizers and boat parade participants from left to right are Jackie Russo-Boudinot of Flat-Bottom Girl; Fred Heine of Boatique USA; CRM Boat Parade Judge Dean McChesney; Bill Sullivan of PAtience, and Michael Melluzzo representing Following C. Not pictured is Cynthia Yerman of Defiance III. 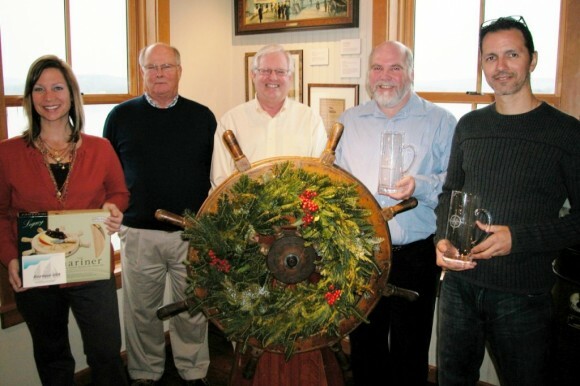 Essex – On Tuesday, December 4, this year’s Trees in The Rigging organizers and participants gathered at the Connecticut River Museum to celebrate victory in the annual boat decorating contest. The event, held on November 25 under the light of a full moon, featured festively-lit vessels passing in review in front of the Museum. Out of a field of 14 participants in the judged competition, Chis and Casey Clark of Following C and Bill Sullivan of Patience tied for first place while Dave and Jackie Boudinot of Flat-Bottom Girl took second place, Cynthia Yerman of Defiance III was awarded third place, and an honorable mention was given to Two Coots in Two Kayaks. Judges Dean McChesney, Pam McChesney and Chantal Lawrence were extremely impressed with the creativity and execution of this year’s contest. So much so they came up even when deciding between the glorious green tree created by strategic lighting of the ketch Patience’s rigging and the dazzling display of lights and artistry that turned the 44-foot Following C into a floating snow globe. Each first place team won a etched glass pitcher and glass set donated by the Connecticut River Museum. The second place, 24-foot pontoon Flat-Bottom Girl was honored for its use of white lights to create a brilliant star atop a luminous tree and was awarded a $50 gift certificate and nautical cheese board set donated by Boatique USA. The third place Defiance III was recognized for its conversion to Santa’s sleigh, complete with Rudolph’s red nose lighting the way, and received a nautical welcome mat donated by the Connecticut River Museum. Two Coots in Two Kayaks was literally a last minute entry, popping their lighted rigs into the river and paddling up the tail end of the procession, names unknown. Trees in The Rigging is a community event presented annually by the Connecticut River Museum, the Essex Historical Society, and the Essex Board of Trade. The Year of the Role Model is being celebrated in our community, and it has me thinking about an important role model from my own youth. Mr. John Mills, my high school band director, had a profound influence on my development as a young person, one that I still feel today. As I reflect on my time with him, I’m struck by something. What stands out in memory is not so much what he said to us but how he conducted himself. Somehow, without doing a lot of lecturing about it, Mr. Mills taught us all we ever needed to know about commitment and professionalism. These critical traits have made an immeasurable difference in my professional life as both social worker and weekend musician. Some 25 years later, I find his example offers me another important life lesson, one that hits closer to home. What I do around my kids is at least as important as what I say to them. In other words, “Do as I say, not as I do,” doesn’t cut it. If we want our children to act a certain way, there is no better teaching method than to role model that behavior. REGION 4 — The Region 4 Supervision District Board of Education will consider a new three-year contract for district teachers, and proposed changes to the 2013-2014 school calendar, at a meeting Thursday. The session convenes at 7 p.m. in the library at John Winthrop Middle School in Deep River. The supervision district board is a large group comprised of all of the elected members of the Region 4 Board of Education, and the local school boards for Chester, Deep River, and Essex. The agreement with the Region 4 Education Association bargaining unit was negotiated in early October with assistance from a mediator assigned by the state Department of Education. Superintendent of Schools Ruth Levy said last week the three-year contract that extends to June 30, 2016, has been approved by the teachers union. Levy said details of the contract, including salaries and benefit changes, would not be released until the Dec. 6 meeting. Last week, a calendar committee of the boards gave a tentative endorsement to a proposed 2013-2014 school calendar that would again honor the Jewish holy days of Rosh Hashanah and Yom Kippur, make Columbus Day a holiday for students and a professional development day for teachers, and hold classes on the second Monday in November Veterans Day holiday. The proposed calendar would also cut the February 2014 winter vacation from a week to two days, including the required President’s Day holiday. Both the calendar and the teacher contract require approval from each of the four Region 4 school boards.